Such chiral objects are ubiquitous in nature, from rotating galaxies to the DNA double helix. Chirality of light can be defined when its phase winds along its propagation axis. In the 1990s, it was recognized that harnessing such a chiral feature of light fields, called the orbital angular momentum (OAM), could be technologically advantageous. Indeed, OAM represents an unbounded degree of freedom, as the phase front can theoretically wind an arbitrary large number of times within an optical period. It therefore offers a drastically enlarged basis for encoding information in comparison to the commonly used polarization states of light, which are limited to a two-dimensional basis. Multiplexing information in such a higher-dimensional basis would offer the possibility to enhance the efficiency of both classical and quantum information protocols dramatically. Furthermore, transferring such large values of angular momentum to massive particles is a powerful asset for optical manipulation schemes at the atomic scale (i.e. atomic tweezers). Researchers from the team led by Jacqueline Bloch at the Centre de Nanosciences et de Nanotechnologies (C2N, CNRS—Univ. Paris-Sud/Paris-Saclay) in Palaiseau, together with collaborators from Laboratory PhLAM in Lille and from Institut Pascal in Clermont-Ferrand, have reported the demonstration of a novel integrated laser architecture that emits light in a chiral state, thus producing corkscrews of light. The disruptive advantage of this microlaser lies in the possibility of controlling the orientation of the corkscrew (from clockwise to counter clockwise) by simple optical means. Their work has been published in Nature Photonics. In order to generate these chiral states of light, the researchers have used an approach based on two main ingredients. 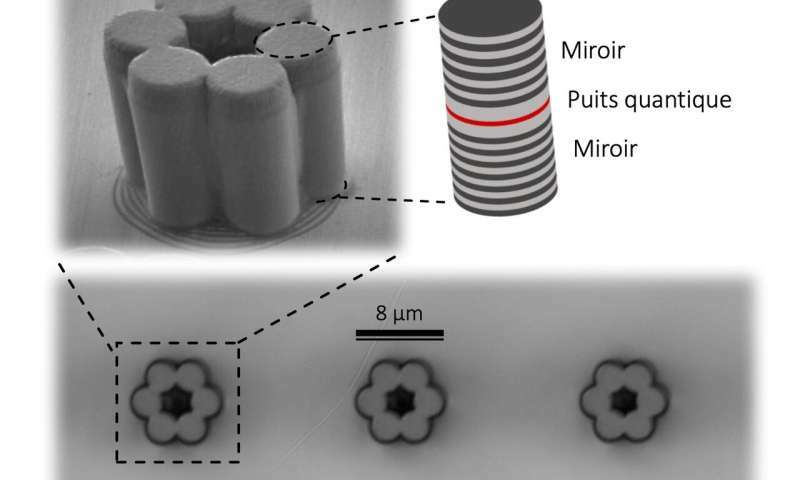 First, they fabricated a hexagonal laser cavity formed from six coupled micropillars. As a result of the rotational symmetry of their device, the resonating modes present OAM with well-defined values. Secondly, in order to favour emission from either clockwise or counter-clockwise optical modes, which requires breaking time-reversal symmetry in the system, they took benefit of an engineered coupling between the polarization and the OAM of light. This coupling allows generating a lasing emission with a net chirality by using a circularly polarized optical pump. As a result, this novel microlaser emits clockwise or counter-clockwise coherent light depending on the circular polarization of the optical pump.